Somewhere in my contract (with the Devil) it says that I have to cover meaningless spats between blow-hard celebrities as long as one of those celebrities has sold millions of records. 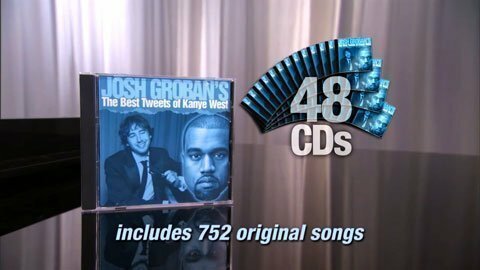 But in all seriousness, Kanye West is one of the all-time great hip-hop producers and this year he's emerged as one of the most talked about celebrities due in large part to his enigmatic record, Yeezus, his baby with Kim Kardashian, and his lack of filter when it comes to talking about issues of race, class, and other touchy social issues. His interview with Zane Lowe for the BBC set off a spat with Jimmy Kimmel when the late night talkshow host spoofed it using children to portray the conversation. The Kanye West - Jimmy Kimmel interview raises some good points. Even after Kanye angrily called Kimmel and started the absurd twitter trend of #NODISRESPECTTOBENAFFLECK #ALLDISRESPECTTOJIMMYKIMMEL, Kimmel is quick to point out that he's met Kanye at a wedding and considers him to be a nice person. Kanye shares his frustration that celebrities are treated "like zoo animals" and Kimmel agrees that's unfair. When Kanye calls himself a genius, Kimmel is quick to point out that most people would never say such a thing even if that's what they believe - which spurs an interesting back-and-forth about success, humility, and honesty. 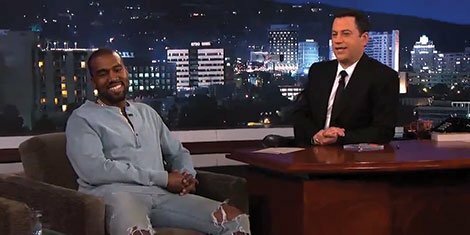 There is a heart touching moment when Jimmy Kimmel gives Kanye the gift of baby sized leather jogging pants, for little North West. The leather jogging pants were the point that was most lampooned during the Kimmel spoof of the Zane Lowe interview as Jimmy found their impracticality to be comical. Kanye responds that fashion isn't practical. The interview ends with Kanye ranting against classicism as the new racism, and his frustration dealing with the snobbery of the established worlds of fashion and Hollywood media. In the end, he feels disrespected by the paparazzi and explains that he just wants to educate and make people happy. Noble goals, for sure.